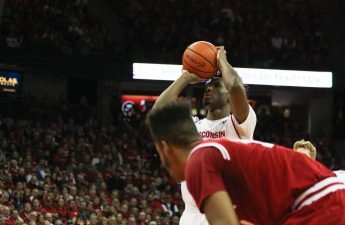 The careers of University of Wisconsin men’s basketball players Zak Showalter, 23; Nigel Hayes, 22; Vitto Brown, 21; and Bronson Koenig, 22, came to a sudden end Friday, March 24, at approximately 11:52 p.m. CT, when Florida’s Chris Chiozza darted the length of the Madison Square Garden floor and drained a buzzer-beating, 3-point floater to stun UW. Facing the uncertainties of what seem like life-and-death situations, as is the peril of a senior’s career in March, the players fought valiantly over the last few weeks. Even when so-called experts and the selection committee gave them minimal time to live, they never gave up. Showalter’s miraculous running 3-pointer to send the game against Florida to overtime gave their loved ones an extra five minutes. It seemed like fans would have the chance to cherish at least two more days with the foursome, until Chiozza’s shot caused four stellar careers to flatline in an instant. While sudden and quick, it would be incorrect to categorize the passing as a peaceful death. It was painful and heartbreaking, a fitting end to careers that have suffered four excruciating defeats to end four seasons: Aaron Harrison’s 3-pointer in 2014 in the Final Four, a second-half blown lead against Duke in the title game, a turnover-filled final minute against Notre Dame and now this – a proverbial dagger that carried the same effects as a literal dagger, a finality that there will be no tomorrow, no next time and no next year for four UW careers. They finished tied with the 2013-16 senior class as the winningest group in Wisconsin history, amassing 115 victories in four seasons, contrasted with 35 losses. They finished as the 2014-15 national finalists, advanced to two Final Fours and made two Sweet 16s, in addition to the outright Big Ten title in 2014-15. They won 13 of 17 NCAA tournament games. Their careers spanned perhaps the most successful stretch of Wisconsin basketball ever seen, and we may never see again. But those are just numbers – only existing on the page or on a screen. The memories they helped craft for Wisconsin fans are countless. 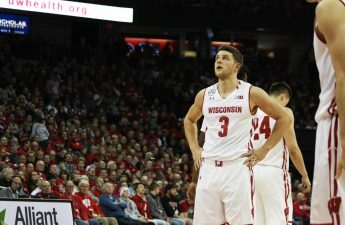 Everyone remembers where they were for the Koenig’s buzzer-beater to surge UW into the Sweet 16 last season, as well as the charge Showalter drew to make that play possible. Hayes’ hesitation-spin move on the baseline to down No. 1 overall Villanova will live on forever. And the conversations surrounding these commemorations will of course include the caveat it was Brown’s outside shooting that buoyed the Badgers through it all. But these are just memories – destined to exist in imaginations for the rest of eternity. What this group accomplished away from the court, however, is truly how they will be remembered. Showalter proved hard work and unrelenting tenacity pays off, whether it is transforming from walk-on to scholarship starter, or hitting the shot of the year and giving the discount double-check to your idol cheering in the stands. Koenig taught us to live for the big moment. Koenig’s clutch shooting will be a constant reminder to own what we are best at. 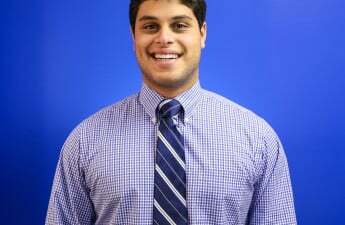 By remaining in touch with his Ho-Chunk roots and participating in the Keystone XL Pipeline protests in North Dakota before the season, Koenig showed us everyone needs a role model, a mantel he has voluntarily carried for young, aspiring Native American basketball players across the nation by refusing to be just a college basketball player with opinions. 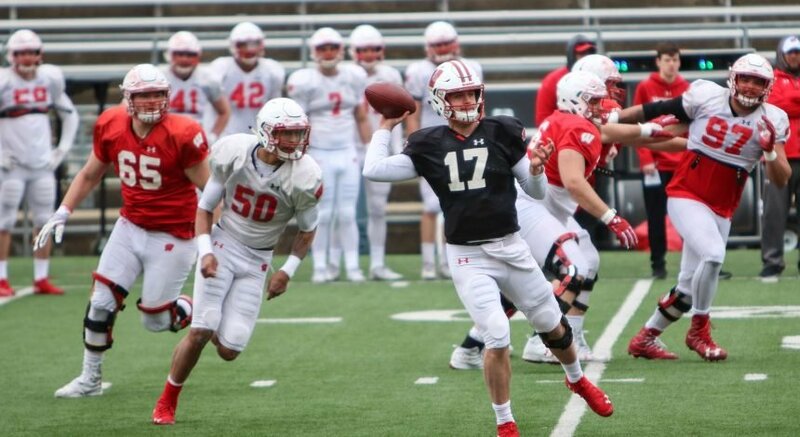 Brown’s perseverance through an at-times tumultuous senior season demonstrated the necessity to stay even-keeled, no matter how trying circumstances may get. It’s easy to not become frustrated when you have baritone pipes from the gods themselves, like Brown does. Brown’s nonathletic talents pointed out having other passions and being well-rounded make for a happy existence. Hayes reminded us we all have a voice and an identity, both of which should be used to construct positive change. Never once did the ire directed at Hayes – and there was plenty of it – for his stances on racial issues in society or the exploitation of the collegiate athlete faze him. Most importantly, Hayes turned opinion into action, like donating the money sent to his Venmo account after displaying his famous sign at College GameDay to purchase presents for the Dane County Boys and Girls Club. That is real impact, and that is what will live on in our hearts and minds. The wins and losses fade. The numbers will evade us eventually. What Zak, Vitto, Bronson and Nigel did for UW fans away from the court affected you and me in one way or another, and that is what their legacy will be. 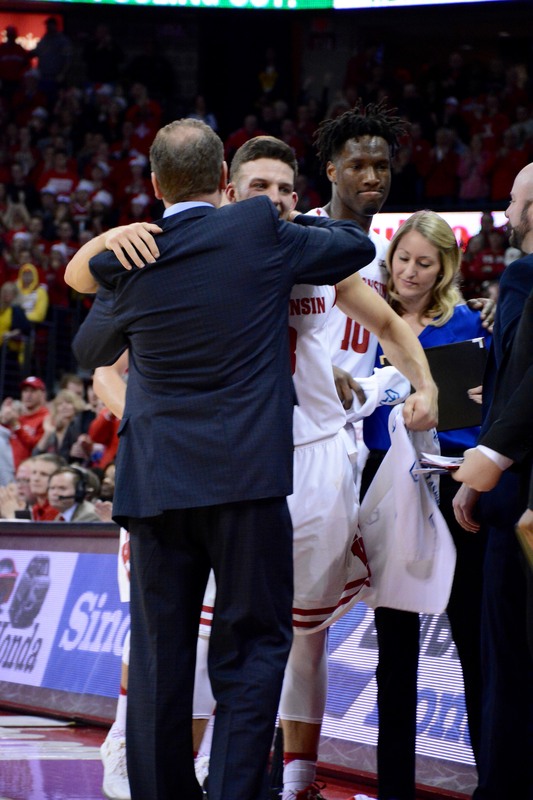 Their careers are survived by their teammates, who are better characterized as brothers: Ethan Happ, Khalil Iverson, D’Mitrik Trice, Jordan Hill, Alex Illikainen, Brevin Pritzl, Andy Van Vliet, Charles Thomas, Aaron Moesch, Matt Ferris, Aleem Ford and Michael Ballard; in addition to the coaching staff and the hundreds of thousands of Badgers fans who will continue to feel their impact in their lives and cherish the memories created throughout the last four years. In lieu of flowers or donations, mourners can signal their appreciativeness by simply thanking Zak, Vitto, Nigel and Bronson for four incredible years on and off the court.